In any weather conditions, LED turn signals, LED tail lights, LED headlights and auxiliary lights provide superior performance over traditional stock lighting. Swapping original e quipment (OE) incandescent headlamps and auxiliary lamps with LED lamps from Harley-Davidson is the fastest and easiest way to attain superior, state-of-the-art visibility for nighttime rides, even in the harshest and most challenging conditions. LED headlamps shine brighter and whiter in color than OE headlamps while providing a superior light pattern. The headlamp’s two D-shaped lenses focus light into a pool directly in the sweet spot in front of the motorcycle, allowing the rider to see further. The separate high-beam projector in the LED headlamp provides a super-bright, super-focused beam that can cut through the deepest darkness. These solid-state LED lights are shock and vibration resistant to take on anything the road can dish out. 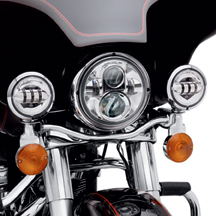 For auxiliary lamp-equipped bikes, Harley-Davidson® four-inch LED Auxiliary Lamps also utilize two D-shaped lenses to focus light precisely where it is needed and provide a perfect match to the LED headlights.They are also designed to replace your stock lights using existing housings and connections. Motorcycle LED Lights: A Difference you can see. The 20 fast-acting red LED lamps on H-D tail lamps give Sportster,® Dyna,® Softail® and Touring models a new look that commands attention, and that's just in running mode. Step on the brakes and the brake lamp LEDs cut through the brightest sunlight, darkest night and harshest weather conditions. 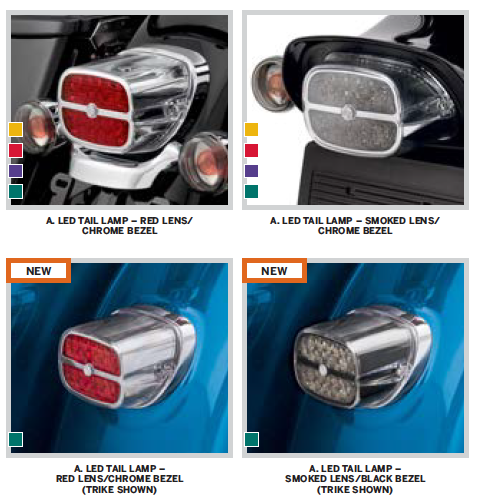 Harley-Davidson® LED Tail Lamps are available with two lens options: red or smoked. Lamp surrounds are available in either chrome or black and are wrapped with a clear housing for a mirrior-like finish. Installation is easy. A simple plug-in connection to your OEM wiring harness is all that's needed. Up front, the extra-bright, fast-acting LEDs serve as running lights and directional indicators. They're available in your choice of smoked or amber lens, both illuminate amber. In the rear, they serve as running lights, directional indicators and brake lights to make certain you will be seen. The rear lights are available in your choice of smoked or red lens, both illuminate red. The LED turn signals attach directly to your stock wiring without any cutting or splicing. It's time to light up your world and get noticed. 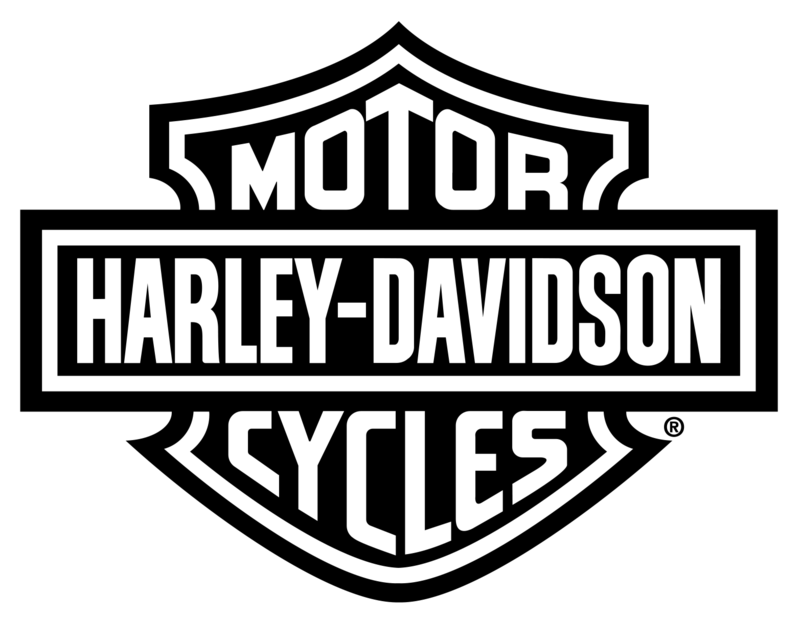 Ask us how we can help you see what you've been missing with Harley Davidson motorcycle LED lights.